Proponents of anti-fracking ballot proposals in Colorado have raised concerns that they may not receive a fair certification process through the secretary of state’s office. The office is in the process of reviewing five initiatives, including two anti-fracking proposals. Two separate ballot proposals were certified this week, bringing the total number of issues on the November ballot to four. The ballot could include nine questions. DENVER – Voters can count on at least four statewide questions on the November ballot, as two more initiatives were approved last week. And there could be as many as five more, including anti-fracking measures that erupted in controversy when the petitions were submitted. On Tuesday, the secretary of state’s office announced that proponents gathered enough valid signatures to place a question before voters that would make it more difficult to amend the state constitution. A day earlier, the state elections office approved a ballot question that would allow terminally ill patients in Colorado to request life-ending medication. Here’s a primer on those measures and some of the pending questions. Amending the constitution Proponents of Raise the Bar – concerning amending the Colorado Constitution – submitted an impressive 183,691 signatures. It takes 98,492 valid signatures to make the ballot. Proponents were well above the projected validation rate based on a random sampling. Likely to appear as Amendment 71, the initiative would require signatures from at least 2 percent of registered voters in each of the 35 state Senate districts to qualify for a ballot. Provisions would need 55 percent of the vote to pass. Existing provisions in the constitution could be repealed by the same simple majority. The ballot question would not alter the proposition process for state statutes. Medical aid in dyingThe Colorado End-of-Life Options campaign submitted 155,676 signatures, and also was above the projected validation rate based on a random sampling. Likely to appear as Proposition 106, the issue would allow terminally ill adult patients with a prognosis of six months or less to live access to life-ending medication. The proposal would change statute, rather than amend the state constitution. Two physicians would need to confirm the prognosis, patients would need to be mentally capable, the medication would need to be self-administered, two oral requests separated by 15 days and a third written request would be required, and patients would have the right to rescind the request at any time. Colorado would join five states with medical aid-in-dying laws. Single-payer health care and minimum wage Two other initiatives previously were approved by the secretary of state’s office, including one question that would create a single-payer health care system and another that would gradually raise the minimum wage in Colorado. The single-payer health care issue – known as ColoradoCare and likely to appear as Amendment 69 – was approved in November 2015, when proponents submitted 158,831 signatures, making it the first question to qualify for the 2016 ballot. The $25 billion proposal would eliminate private insurance for a 10 percent “premium tax” so that the state can cover health expenses. Employers would share employees’ costs. Proponents were shaken this week, as ProgressNow Colorado – the state’s leading group of progressives – held a news conference to oppose the measure. Other left-leaning groups, including NARAL Pro-Choice Colorado, also oppose the measure. The opposition is likely to split Democrats on the issue this fall. Republicans generally oppose the effort. Proponents of raising the minimum wage – likely to appear as Amendment 70 – submitted a whopping 189,419 signatures and were approved Aug. 11 for the ballot. The Colorado Families for a Fair Wage proposal would raise the minimum wage to $12 an hour by 2020. The current minimum wage is $8.31 per hour. Looming initiatives and controversyAnother five initiatives are awaiting validation from the secretary of state’s office. The office has until Sept. 7 to validate signatures. The issues include raising taxes on cigarettes, two questions around creating primary elections in Colorado and another two proposals cracking down on the oil and gas industry, including allowing local governments to ban hydraulic fracturing. The state’s decision on the fracking questions are likely to be closely watched after a spokeswoman for the secretary of state’s office posted a tweet that has the anti-fracking world crying bias. Lynn Bartels, a spokeswoman for Republican Secretary of State Wayne Williams, issued the tweet shortly after proponents of the measures submitted signatures on Aug. 9. “Proponents of fracking measures turned in lots of boxes with very few petitions in them. #copolitics,” read the tweet. Bartels included a photo of the boxes. “At this point, we question whether or not the secretary of state’s office will engage in an honest and unbiased accounting of the signatures,” said Lauren Petrie, Rocky Mountain organizing director for Food and Water Watch, which is spearheading the drive. About 200,000 signatures were submitted between the two initiatives, which amounts to about 100,000 signatures per initiative. The number of signatures does not give proponents much of a cushion, so it’s possible that they won’t make the ballot. One question would allow local governments to enact rules and regulations more stringent than the state. The other would increase setbacks of wells from 500 feet to 2,500 feet. Proponents shrugged off accusations that the fracking issue has lost steam in Colorado, pointing out that they were up against powerful opposition from the oil and gas industry. 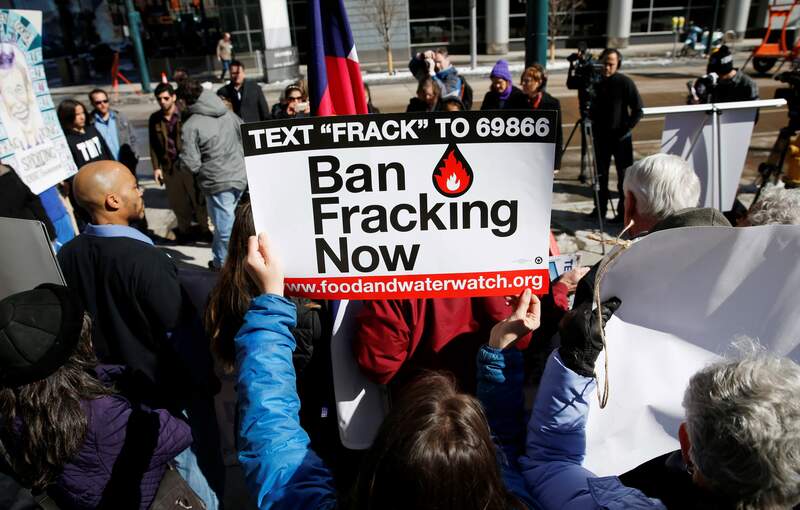 “Until the very last day, there were people that were frantic to sign before the deadline, and I personally had thousands of conversations with people who understood the importance of protecting local municipalities’ health and safety from fracking here in Colorado,” said Lisa Trope, an organizer for Food and Water Watch. Bartels said the validation will be conducted fairly, noting that much of the process is done through an office within the Colorado Department of Personnel and Administration.